Below is an excellent selection of horse drawn wagons and accessories for sale. Some of them are for actual use, while others are for display purposes. A wagon is a horse-drawn vehicle with four wheels made for hauling goods of various kinds, and/or for carrying people. A wagon can be contrasted to a cart, which has two wheels and is designed to carry people; or a carriage which has four wheels like a wagon but is primarily designed for carrying people instead of hauling goods. The phrase "horse drawn," when used for defining a wagon, can be a bit misleading: "Horse drawn" when used in this manner is a generic phrase that also means the wagon can be pulled by other types of animals such as mules or oxen. For good things to know before buying a wagon, please scroll down beneath the items for sale. 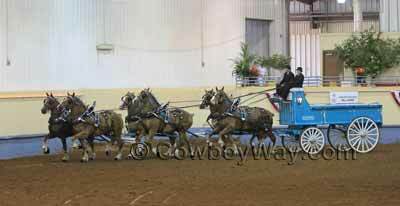 Below: A team of six horses pulling a horse drawn wagon. 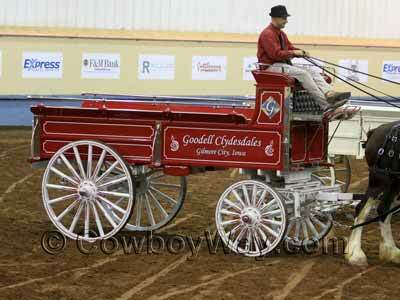 Below: A red horse drawn wagon being shown in six horse hitch competition. 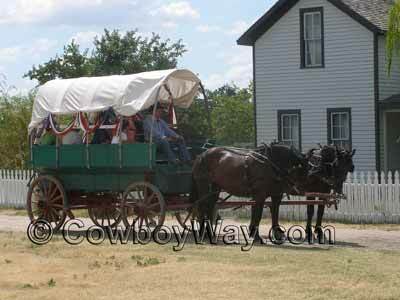 Below are a few good things to know before buying a horse drawn wagon on the Web or anywhere else. Is it really a wagon? Some people call any horse drawn conveyance a wagon when it's actually something else like a cart, carriage, hearse, or sleigh. 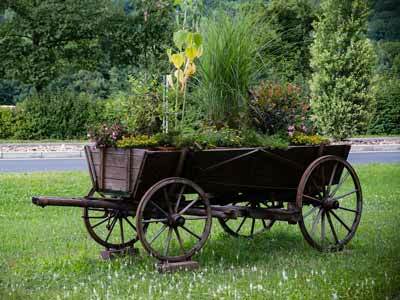 Is the wagon suitable for use as a wagon (that is, hitched to horses or other animals and carrying a load), or is it for sale with the intended purpose of being used for display only? If the wagon is used, what condition is it in? Is it ready to use or will it need repairs? 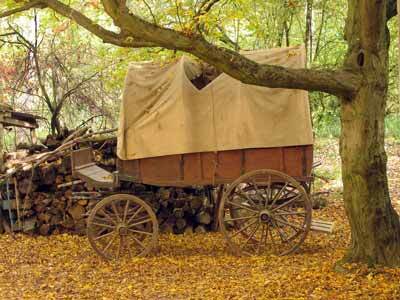 If the wagon has been restored, what parts of it are new/restored, and what parts of it are original? Are there enough clear photos of the wagon, inside and out, that you can get a good look at everything you want to see? If not, you may need to ask the seller for additional photos. What does, and does not, come with the wagon? Don't assume anything comes with it, even if additional items are shown in the photos. Read the description carefully to know what you will, and will not, be getting. How big is it? What does it weigh? Where is the wagon located? Will the seller ship it or deliver it, or will you have to pick it up? If the wagon is for pick up only, how long will the seller hold it while waiting for you to come and get it? If the seller will ship the it, what will shipping charges be? Is insurance included in the shipping charges or will it be extra? Will there be any taxes or other additional fees due? What methods of payment will the seller accepted? How soon after you make your purchase do you have to pay for the wagon? Some sellers are now requiring their items be paid for within a certain time frame or the sale is off. Read the item's description for acceptable payment times and terms. Will the entire payment be due when you make your purchase, or will you put down a deposit then pay the balance at a later time? Note: It is not uncommon for balances due to be accepted in cash or cashier's check only. Can the wagon be returned? If so, what are the conditions for the return? Every eBay item for sale has a "Seller info" area. Be sure to check this area to view the feedback rating that previous buyers have left for that particular seller. eBay offers a free buyer protection plan for many items. Be sure to read the details and eligibility under "eBay Buyer Protection." If you have any questions about a wagon you might be interested in be sure to ask the seller before you buy. Look for the "Ask a question" link in the "Questions and answers about this item" area to ask your questions. As we mentioned at the top of this page a wagon is a four-wheeled vehicle pulled by work animals (commonly horses, mules, or oxen) made for hauling goods and/or cargo. While wagons are typically considered a conveyance to transport items, not people, it is not uncommon for them to transport people as well. Below is a wagon whose design was originally intended to haul goods. This one though, has been modified to add extra seating in the back. It is used to carry people on wagon rides. This wagon is similar to the one above. Instead of being used as horse drawn wagon, however, it has been retired from actual use and is now for display. Wagons are commonly used for display purposes only. This one makes a beautiful planter. 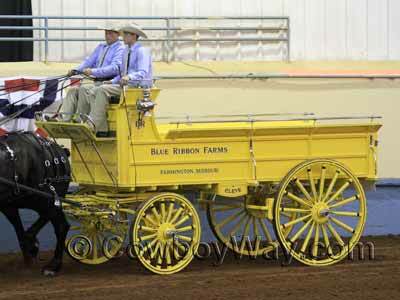 This beautiful horse drawn wagon is in excellent condition and is used competitively to show in six horse hitch competitions.